GIVE YOUR KIDS A BIG SURPRISE AT THIS EASTER DAY! 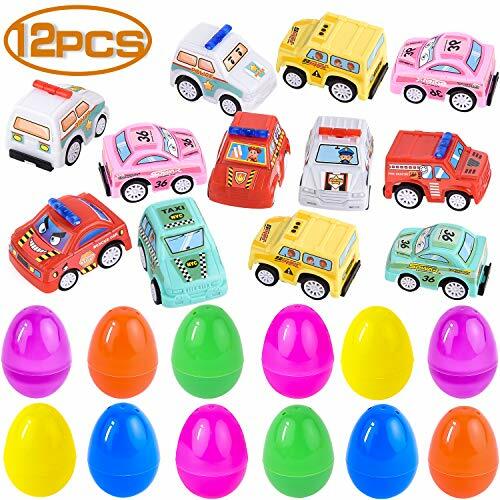 【ALL PULL BACK CARS】12 pcs colorful eggs (6 colors), 12 pieces pull back cars. Don't need batteries, don't need to charging, your kids can play it all the time. 【HAVE AN EASTER EGG HUNT WITH YOUR KIDS】Every year, we believe you will want to have a fun day with your kids in Easter Day, right? Then, how can you miss this surprise eggs! This will never let you down! 【GREAT FOR PARTY FAVORS】There are 12 easter eggs with 12 cars inside, so, your child can share this toy with his/her friends! They will discuss and communicate, have fun together, isn't that so cool?! 【GREAT AS EDUCATIONAL TOYS】It is not only a toy, but also can well help your kids to promote intellectual development, when your child completes the stitching of a vehicle independently, his happiness is beyond words!